Hello there! My name is Bonnie Barton. Based in Austin, TX. vintage loving, and always finding beauty in everything. Welcome to my world. So... I have finally decided to wear something that requires a little thought. I find the whole dress thing a little boring after a while, and putting together separates was the perfect cure to my lazy repetition. Also, this outfit was fun because I feel like I am in a disguise! Its always fun to pretend to have an alter ego. I think my name today will be Margot. 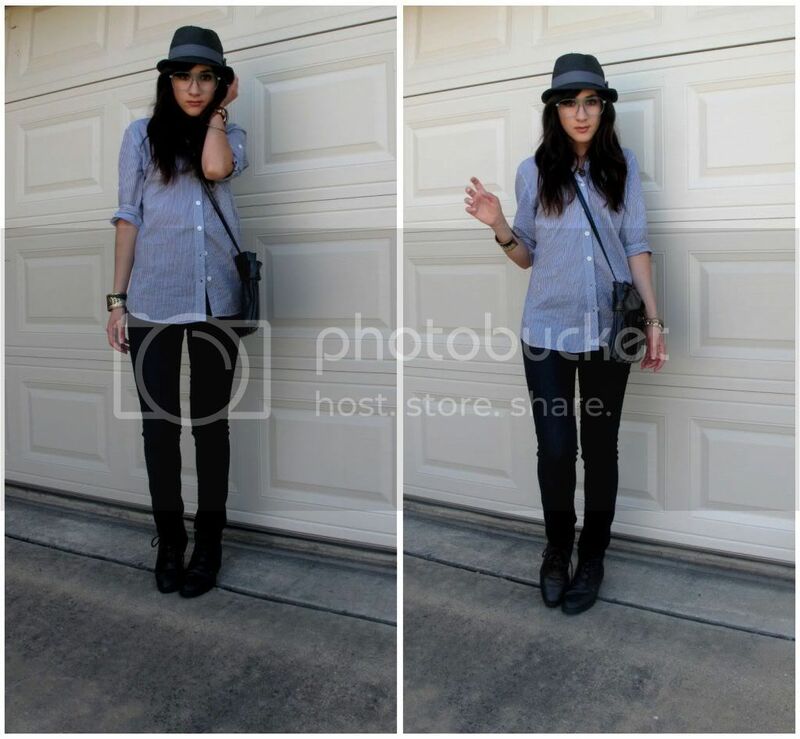 Wearing: f21 top, hat; random jeans; thrifted booties. Nice quirky accessories: shoes and glasses. The glasses match your shirt! I'm new to your blog. I just found you through Weardrobe. I like your sense of style. The way you put outfits together is imaginative and seems to fit you very well. I'll be following you through Google. ooo i love alter ego posts . love love this look..its too cute! What a lovely look, Honey! margot is the perfect pseudonym to go with that ensemble! You look like so much fun. I would definitely be friends with Margot. thanks for the birthday wishes, i adore your glasses, the colour is so wow! Great outfit! 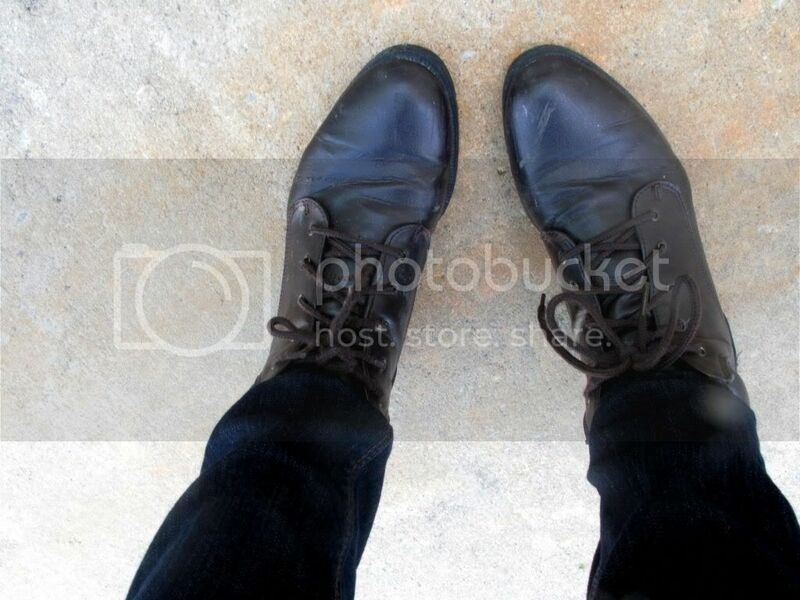 Love your glasses and your boots! You loook amazing ! I love your hat , your glasses and your shirt ! This is so cute! It totally makes me want a grey hat and grey frames. I hope Margot makes more appearances. hey margot, how are you :) are you learning the whole day... you looks great! love it! you look so well put together! the outfits, the cute glasses, the hat and the boots go perfectly well together! btw, i've been wanting those kind of booties. hey margot, UH-MAZING glasses - are they green or is that just my laptop playng tricks on me?? I love this outfit because it looks so professional/geek/hipster, but o a girl. I love the shoes, hat, jeans, shirt... It's an awesome outfit! A spy in the house of love:).Great look! oh these are the most amazing glasses! I love this fabulous outfit!!!! margot, your specs are so hot! 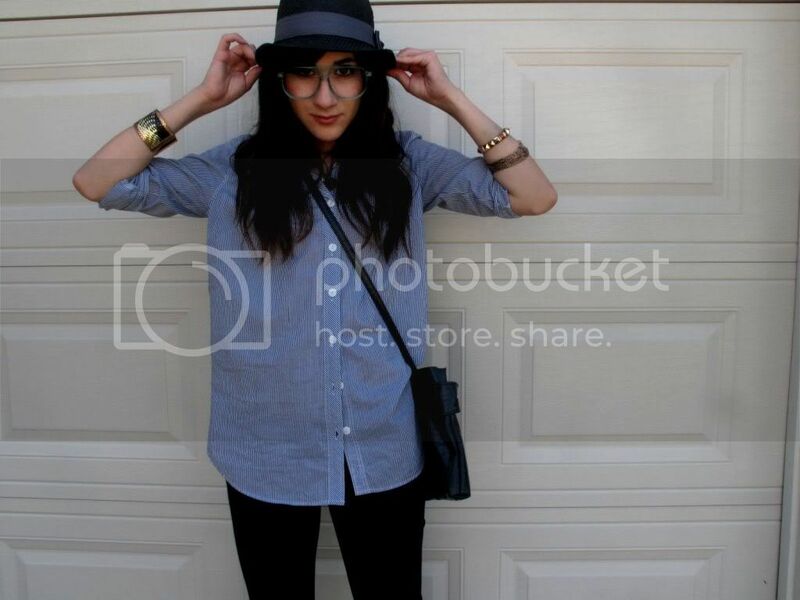 I need a pinstripe blouse like yours :) great hat and shoes too. thank you for your sweet comment..definitely adding you to my blog roll! I love the hat! I wish I could pull off hats :( A cute, quirky outfit. yes, this is very knew to you. i always see you in dresses and beautiful feminine outfits. but this one, looks great on you too! i like those laceup plus those hat and simple polo, perfect outfit! Gosh, I love that shirt. I have been looking for that type of boyishly fitting button-look for at least a month now...The whole outfit looks great on you. your look is so spot on. I want the hat and the shirt! yess .you are the style icon! look...this outfit is so freshhh..casual and boyish! such an adorable style! i really love it! Love this look! I like how it's masculine but still underlines your femininity. Margot sounds really nice :) you look adorable and mysterious! wow we have the opposite problem, i have to make my self wear dresses! you look awesome though! Thanks so much for your message on my birthday! you are so cool girl! Perfect outfit! Simple yet soo cool! The glasses are too cute! Love the glasses and hat! i love this outfit to death! not to mention i love the glasses! Good pick. Margot is a lovely name. HAHA Margot you totally look perfect for your glasses. ;) I'm liking this.